An impressively exhaustive account of the soda industry, its effects on human health, and its extensive efforts to ensure profit triumphs over health concerns. 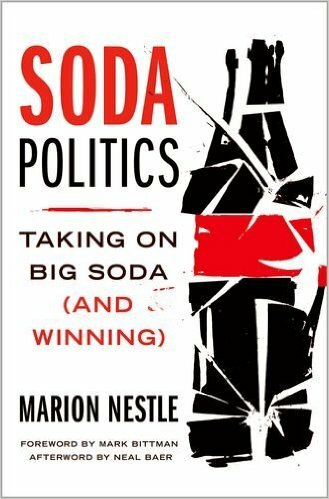 In this book Marion Nestle painstakingly dissassmbles, analyzes and documents every possible aspect of the enormous industry dedicated to selling drinks of sugared, flavored water to people across the planet. Beginning with the health effects, moving through marketing (to children, to minorities, to the developing world), and ending with the various flavours of political advocacy efforts, Nestle leaves the reader with a clear picture of how the industry functions. Soda Politics focuses on the USA, particularly in the sections on political efforts, but Nestle keeps the entire world well in view -- as the soda companies do. Health promoters will likely not find anything new in the health-related sections but will appreciate Nestle's consistent acknowledgement that the health issues to which soda consumption contributes, such as obesity and diabetes, transcend individual lifestyle choices. The startling statistic that sugary drinks comprise fully half of all sugar intake (in the US) shows just how normalized it has become to drink nutritionally-empty calories. Nestle recounts in detail how soda companies go to extensive efforts to shift attention away from calorie consumption and toward physical activity, and how they create "astroturf" groups (false "grassroots" groups that are industry-created and -funded) to fight any tax, policy, or regulation that would limit soda sales. "To public health advocates familiar with the actions of tobacco companies, the response of soda companies to obesity seems all too familiar. Soda is not tobacco, of course, and the problems it causes depend on how much is consumed, and how often. But the soda industry's playbook -- the script it follows -- is a carbon copy of the one used by cigarette companies to deflect attention from the hazards of smoking." "Take your kids to a high-income neighborhood, low-income neighborhood, and a largely minority neighborhood and do some comparisons. Which neighborhood makes sodas more readily available? Which neighborhood makes fresh fruits and vegetables more readily available? Why do these differences exist?" It's worth a read (Don't be put off by the length: the last third is a collection of resources, references, and other supporting material.). While one is left feeling a bit squashed by the enormous industry behemoth of funding and advocacy, Nestle is careful to end on a hopeful note, describing small wins and the momentum those wins are creating. It feels much like the early days of tobacco control -- and see how far that has come in the last thirty years! Perhaps thirty years from now Soda Politics will be a curious historical artefact of a strange, bygone world. We can only hope. Coming in October 2015 from Oxford University Press.